specter haunts the fast-aging “New American Century”: the possibility of a future Beijing-Moscow-Berlin strategic trade and commercial alliance. Let’s call it the BMB. Its likelihood is being seriously discussed at the highest levels in Beijing and Moscow, and viewed with interest in Berlin, New Delhi and Tehran. But don’t mention it inside Washington’s Beltway or at NATO headquarters in Brussels… the tectonic plates of Eurasian geopolitics continue to shift, and they’re not going to stop just because American elites refuse to accept that their historically brief “unipolar moment” is on the wane. As we have discussed earlier, the US tries to ‘isolate’ Russia and China, through Ukraine and Japan. As far as it is possible to isolate giant land masses like China and Russia in the first place. Perhaps it makes more sense to say that the US keeps its proxies EU and Japan isolated, by setting them up against Russia and China respectively. The “Chinese dream,” put forth by Chinese President Xi Jinping, is to build a moderately prosperous society and realize national rejuvenation… The Chinese Dream integrates national and personal aspirations, with the twin goals of reclaiming national pride and achieving personal well-being. It requires sustained economic growth, expanded equality and an infusion of cultural values to balance materialism. In other words: let the US own the oceans, so they can use their king size navy to regulate whale traffic there, while China does business with Russia and Europe… over land. Exit global controller and thalassocratic power USA. Once upon a time not so long ago, Beijing’s leadership was flirting with the idea of rewriting the geopolitical/economic game side by side with the United States, while Putin’s Moscow hinted at the possibility of someday joining NATO. No longer. Today, the part of the West that both countries are interested in is a possible future Germany no longer dominated by American power and Washington’s wishes. Meanwhile, with the US Navy controlling global sea lanes for the foreseeable future, planning for those new Silk Roads across Eurasia is proceeding apace. The end result should prove a triumph of integrated infrastructure—roads, high-speed rail, pipelines, ports—that will connect China to Western Europe and the Mediterranean Sea, the old Roman imperialMare Nostrum, in every imaginable way. Other planned route: Xian, Central Asia, Iran, Iraq and Turkey’s Anatolia, ending in Venice. China plans roads, high-speed rail, pipelines and fiber optic networks to link the country with the rest of Eurasia. Umruqi (3m) in desert of north-west China is going to be a hub in the entire system. 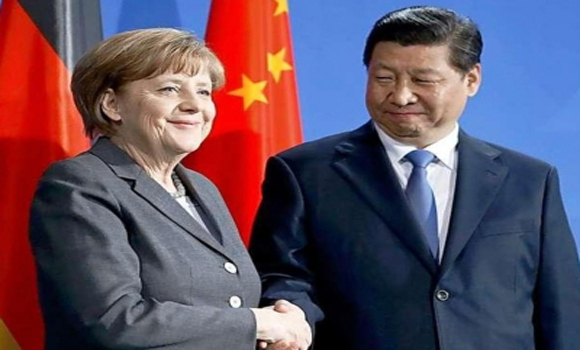 In 2018, China could very well be Germany’s top trading partner. Currently Europa is torn apart over Ukraine. Italy and Hungary are pro-, UK, Sweden, Poland, Baltic States and Romania are anti-Russian, Germany holds the middle. Escobar thinks that by 2025 BMB could be a reality. The 11,179-kilometer Yuxinou (Chongqing-Xinjiang-Europe) International Railway, honored as the ‘modern Silk Road’, was officially put into operation on Aug.31. It starts in Chongqing, crosses the Alataw Pass on the border of China into Kazakhstan, and then travels through Russia, Belarus and Poland before arriving in Duisburg, Germany… Via the new railway, it only takes 16 days on average to transport goods from China to European backland, 20 days shorter than ocean shipping from China’s eastern areas.